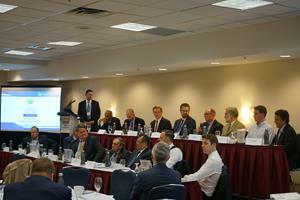 CHALK RIVER, Ontario, Nov. 07, 2018 (GLOBE NEWSWIRE) -- Canadian Nuclear Laboratories (CNL), Canada’s premier nuclear science and technology organization, is pleased to announce that it facilitated discussions between small modular reactor (SMR) vendors and representatives from the Canadian nuclear supply chain during its fourth SMR Vendor Roundtable today, held on the margins of the Generation IV and Small Reactor Conference (G4SR) in Ottawa, Canada. Co-hosted with the Organization of Canadian Nuclear Industries (OCNI), the event was the fourth in a series of meetings that brings together world leaders in nuclear science and technology to discuss the advancement of next-generation clean energy technology. Preceded by an OCNI-hosted vendor-supplier matchmaking event designed to pair reactor developers with Canadian suppliers, the roundtable enabled these organizations to meet to discuss requirements, capabilities and areas of potential co-operation in the deployment of SMRs within Canada. In particular, discussions focused on the advantages of Canada’s supply chain for supporting the deployment of reactor fleets, and the latest technical advances in construction and manufacturing. CNL continues to build its expertise and infrastructure to support the development of SMR technologies. The proposed flexibility of these new designs enables a wide range of applications beyond electricity generation, including pairing SMRs with intermittent renewable sources such as solar or wind energy to ensure grid reliability. Energy from an SMR could also be used for the production of hydrogen, district heating, desalination, or in industrial processes that require heat and electricity. Based on responses to CNL’s Request for Expression of Interest (RFEOI), which sought feedback from the domestic and international community on its SMR Program, there is a strong consensus that the establishment of an SMR industry in Canada would also lead to significant economic benefits to the country, particularly within the Canadian nuclear supply chain. Momentum in SMRs and advanced reactor technologies is building in Canada. Co-hosted by CNL and the Canadian Nuclear Society, the G4SR conference also served as the venue for the Government of Canada to launch Canada’s SMR Roadmap Project report. Convened in 2017, the roadmap represents the culmination of a ten-month program of engagement with the nuclear industry, as well as potential willing end-users that includes Northern and Indigenous communities and resource industry stakeholders, exploring a national path forward for these new nuclear technologies. For more information on CNL’s SMR Program, including plans to site a demonstration reactor on a CNL-managed site, please visit www.cnl.ca/smr. Canadian Nuclear Laboratories is a world leader in nuclear science and technology offering unique capabilities and solutions across a wide range of industries. Actively involved with industry-driven research and development in nuclear, transportation, clean technology, energy, defense, security and life sciences, we provide solutions to keep these sectors competitive internationally. For more information on the complete range of Canadian Nuclear Laboratories services, please visit www.cnl.ca or contact [email protected].